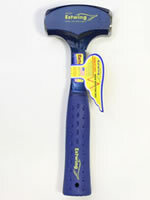 A crack hammer is a heavy hammer that is used for breaking rocks and chisel work. Some people call them sledge hammers or hand sledges. They are produced in different sizes to suit people of different strength and different types of work. Always wear eye protection when using these tools. This is the small 2-pound crack hammer. It is used for chisel work or breaking small rocks and masonry materials. The head and handle are forged from a single piece of steel, and the soft grip is designed to reduce the vibrations of impact. Length: 10.75". This hammer is much easier to control and is less fatiguing than the heavier hammers. Remember that accurate hits break more rocks than wild bashes. 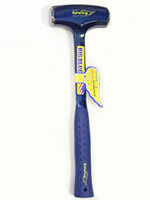 This is the meduim 3-pound crack hammer. It is used for chisel work and breaking rocks or masonry materials. This hammer is for an experienced person with strong hands. The head and handle are forged from a single piece of steel, and the soft grip is designed to reduce the vibrations of impact. Length: 11". This is the heavy 4-pound crack hammer. 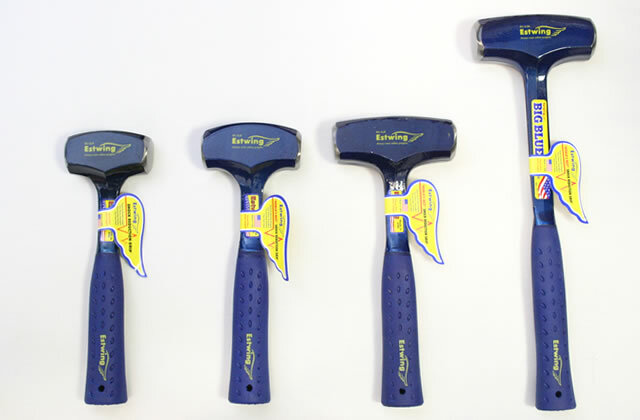 It is used for chisel work and breaking larger rocks or masonry materials. The head and handle are forged from a single piece of steel, and the soft grip is designed to reduce the vibrations of impact. This hammer is HEAVY. 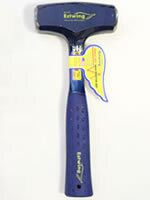 It is recommended for a strong, experienced person who can deliver an accurate hit and control the hammer after impact. If you do not have strong hands and forearms, this is probably the wrong hammer. Length: 11.25". 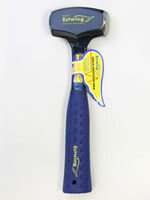 This is the heavy 4-pound crack hammer with a longer handle that can be used with two hands. It is used for for breaking large or especially stubborn rocks. The head and handle are forged from a single piece of steel, and the soft grip is designed to reduce the vibrations of impact. Length: 15.75". Have you have ever carried a heavy crack hammer in an inexpensive belt loop? Yep, it is a great way to drop a hammer on your foot! If you have tried that, you will know the value of a holster with a long heavy bridge and an adjustable buckle and billet. This holster is designed to carry Estwing and other crack hammers between two and four pounds. The back has two slots that accomodate belts up to 2" wide.